In early 2011, Dwyer Quality Homes owner Wayne Dwyer noticed the increase in buyers purchasing homes for investment and felt a need to provide a more specialised product and service for the potential property investor. With a finance, property and marketing background Jason Dwyer, Wayne’s brother, was the perfect fit to set up a company which would help investors through this often complicated and time consuming process. Starting with detailed research of the areas, the stats and the growth and rental figures Jason became the expert at picking the hot spots and is able to secure key lots in the fastest growing estates of the region due to his strong relationships with key land developers. Not satisfied with simply building average houses in good areas, Jason set to work to design houses which would be in high demand with tenants, in turn maximizing the investors’ rental yield. There was confusion in the market and Jason wanted to make sure Dwyer Property Investment packages were totally rent ready. This meant creating packages with everything included suiting the investor looking to get their properties tenanted as quickly as possible, to a good tenant and at a good price. 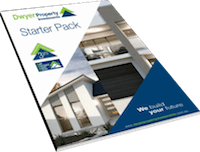 There is a difference between Dwyer Property Investment’s rent ready packages and other builders’ ‘turnkey’ packages. YOU can move into a turnkey package but you would not be able to rent it without spending more money. At first this was met with some market resistance as the prices seemed higher than the competition but now the fully inclusive package with no extra costs is the trademark for Dwyer Property Investments. Not satisfied to optimise the location and the property itself for investment, Jason had to overcome some fear amongst investors that their investment might sit there empty and without rental income. This fear was resolved by the introduction of the unique 3 year rental guarantee. Competitors had what seemed like similar offers but they all came at a price to join and still charged a Property Management fee on top of that. Jason crafted the 3 year rental guarantee to be free from any fees, providing a fixed price rental income giving total peace of mind for the investor. Jason has developed a network of independent professionals who work closely with him to assist his clients through the property investment process. They are all business to business relationships so there are no referral fees paid to, or taken from any of the Dwyer Property Investments professional network – meaning no extra cost to the client. In fact, in many cases the network of professionals offers a discounted industry rate to any Dwyer Property Investment clients. Over the past four years Jason and his team have created a business model which allows clients to buy a good quality investment property in a great location without risk, and the process is made easy while achieving good rental returns while property value goes up.